In the August 11, 2010, "Wordless Wednesday" article at Genea-Musings, Randy Seaver posted a very intriguing photograph. Two beautiful models of buildings made from match boxes by his relative, Edgar Carringer in ca. 1896. It was love at first sight for me and I wanted to know more about the subject matter of this photograph. Was this another form of art of the common man, similar to tramp art? Was it every artist for himself, or was the art form so popular that patterns had been produced? Randy very graciously allowed me to use his family photograph, seen below and in the three insets. Another curiosity? Did Edgar Carringer do wood work on a lathe and want to display this talent in the photograph as well? Look at the wood cup displayed on top of one of the houses. Friction matches were invented in 1829 and made their appearance in the United States sometime after 1830, but were not generally used until several years later. The estimated consumption per individual in the United States in 1883, was seven matches per day. Matches were made for special uses, — the parlor match, which used no sulphur and was free from the chocking sulphur fumes; the smoker's match, which had a strong flame and could be used to light a cigar in the wind or rain; and the wax match, which burned a long time, and was an elegant affair for dainty uses. Matches were called Lucifers, Locofocos, and Congreves and sold for a half-penny each. The matches were placed in small paper or strawboard boxes varying in size, capable of containing from 65 to 500 matches. It would seem Edgar Carringer had a lot of material to work with based on the amount of matches that were being used in the United States when he built his models. In 1889, there were eighty establishments in the match making business. The manufacture was enormous, reaching about 15,000,000,000 matches a year. The most famous match manufacturer being Diamond Matches. Research indicated that match box classes were taught in woodworking classes in the schools. What isn't indicated is whether the classes taught you to make a match box, or to make something with a match box. I found no match box model patterns, so it would seem the construction was in the mind and hand of the artist. The houses constructed by Carringer were probably of places he knew well such that he could make an accurate representation. The article below was reproduced in many magazines in the United States and was probably inspiration for those who engaged in match box model making. While the match company below created and staged competitions, I have yet to find such competitions in the United States. It would appear Carringer was proud enough of his art work to memorialize it in a photograph. THESE pages are an eloquent testimony to the extraordinary skill and ingenuity of artisans and others in the Midland districts. Two or three years ago a particularly enterprising firm of match-manufacturers, Messrs. S. I. Moreland and Sons, of Gloucester and Birmingham, hit upon the excellent idea of getting up public competitions on entirely original lines. 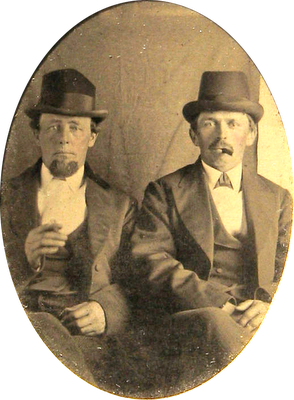 Of course, the firm's primary motive was the sale and general advertisement of their wares; but they also considered how they should best tap the wonderful fund of originality which they knew the average British workman does possess, no matter what his traducers say. 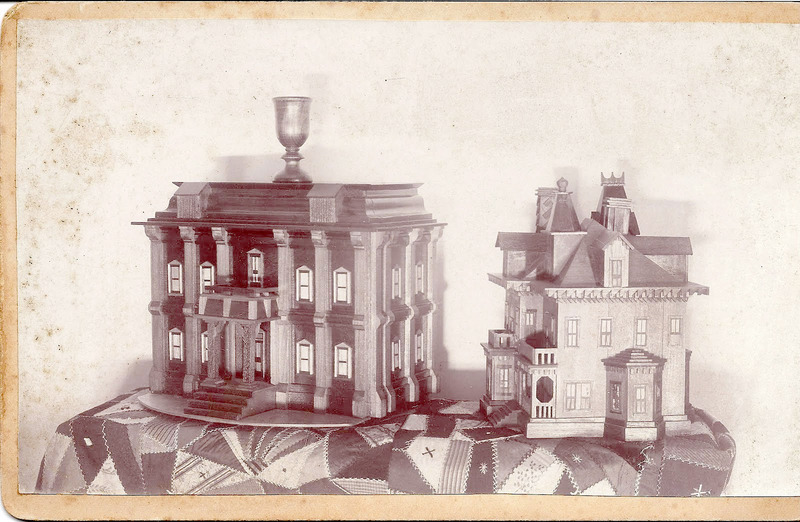 It was at length resolved that the competition should take the form of model-making— "the greatest novelty of any sort that can be made with not less than 1,000 of our matchboxes." The conditions were widely advertised in Birmingham and its environs. Competent judges—architects, chiefly—were appointed. The first prize was ,£50, the second, £25, third £10, and then came three other prizes of £5 each. In subsequent competitions, however, the amounts were slightly varied, but in all cases the prize money aggregated £100. Models were to be sent carriage paid to Messrs. Moreland and Sons' Birmingham depot, 155, Great Charles Street, and those winning a prize became the absolute property of the firm. Messrs. Moreland hired a shop in Birmingham for the express purpose of exhibiting to the public the prize-winning models. In this article, then, will be found a representative collection of photographs of these "marvels in match-boxes." In some cases the model occupied the spare time of its creator for six months or more; and the effect of the whole was heightened by clockwork arrangements and similar contrivances. It is to Messrs. Morelands' Birmingham manager, Mr. George Blakely, that we are indebted for most of the photographs. The wonderful piano seen in the first photograph is actually full size, being 5ft. 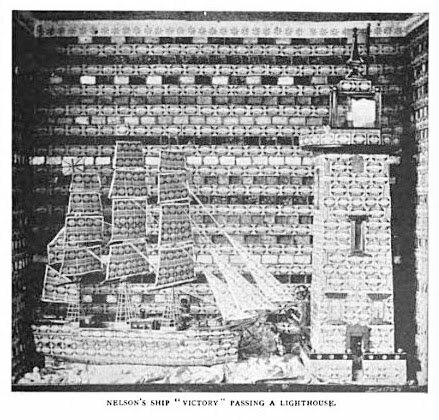 in height, and constructed entirely of matchboxes, which, according to the rules of the competition, must have contained Messrs. Morelands' wares. 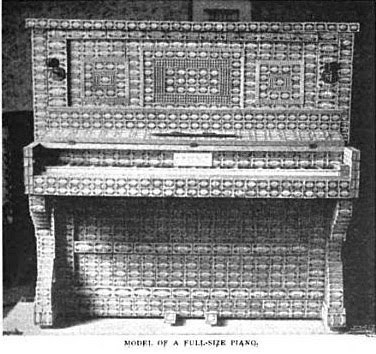 The instrument was awarded first prize in the third competition, so that it may be said to have fetched the price of a real cottage piano. The judges were Messrs. Gately and Parsons, well-known architects in Birmingham. The maker of the piano was Mr. G. W. Roberts, of 2 Wenman Street, Birmingham. Mr. Roberts served as tuner for many years with the well-known house of Broadwood, so that a piano suggested itself naturally to him. He tells me that he used upwards of 3,200 ordinary match-boxes, and 576 boxes that had contained small wax-vestas. The only other thing he used was 51b. of glue. Originality seems to run in the Roberts family, for we next show a marvellous model of the great Laxey Wheel, in the Isle of Man, made by Miss L. W. Roberts, sister to the designer of the piano. 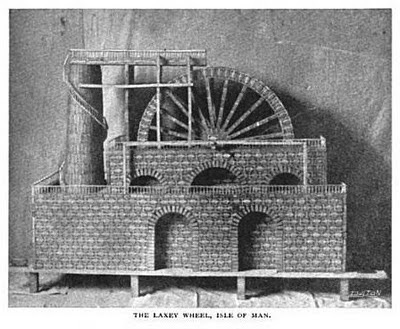 "The Laxey Wheel," writes Mr. Roberts, "was 6ft. in length and 4ft. high. It took a little less than six months to make, and used up about 3,000 match-boxes." In some cases more than one competitor took the same original for his model. For instance, the Laxey Wheel was also adopted by Mr. James Shaw, of 56, Dickinson Street, Nottingham. Mr. Shaw's model, which won the first prize, was no less than 6ft. 74in. in height, 2ft. in depth, and 8ft. in length. It contained 4,500 boxes, and took five months to complete. The wheel itself was 5ft. 6in. in diameter, and went by clockwork. Another competitor, Mr. Lewis Sheldon, of 49,Foundry Road, Winson Green, Birmingham, constructed a double masted turret ship-of-war, 8ft. 3m. long. The completeness of this model was astonishing; the ship carried fifteen guns (all made out of match-boxes), and there were six lifeboats. The next two models shown are the work of Mr. F. Marshall, of 13, Manor Avenue, Sneinton, Nottingham. 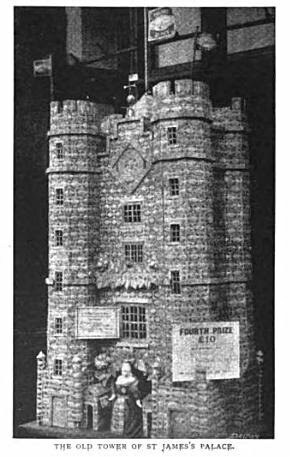 The first of Mr. Marshall's models depicted gained the third prize in the second competition. It is a very faithful reproduction of the Forth Bridge, and is, of course, made entirely out of match-boxes. The height of the model is 1 ft. 10 in., the width 12 in., and the length no less than 10ft. 6in. 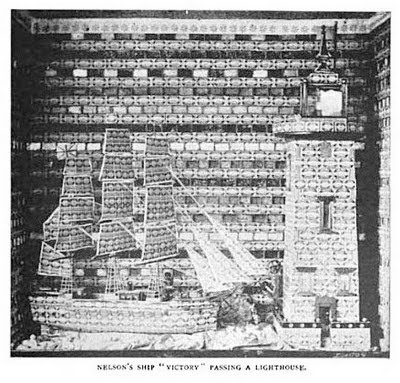 The model contained about 3,000 boxes. I may here repeat the statement, that according to the rules governing the competitions models were to contain at least 1,000 boxes. "Other than match-boxes," writes Mr. Marshall, "no material whatever is used in the construction of the bridge—not even in the stays. When completed it stood the test of 421b. weight in the centre of either arch. I never saw the original bridge, but got an idea of it from a lithograph in a railway guide. The model contains 241 stays and twelve principal pillars. Seven rows of match-boxes form the roadway over the bridge, and on this roadway are laid the sleepers and rails." 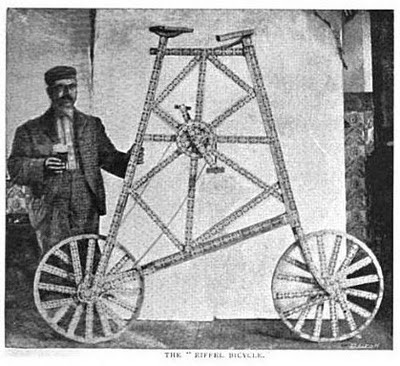 Mr. Marshall's second model is what is known as an Eiffel bicycle. When complete, this model was in full working order. It contains 1,100 match-boxes, and stands a little more than 6ft. in height. The diamond stays are two boxes thick. The driving chain is 9ft. long, and was made from the sides of the matchbox-drawers glued on to tape. The wheels are 24m. in diameter. Another model of Mr. Marshall's was a reproduction of the lighthouse near New Brighton. 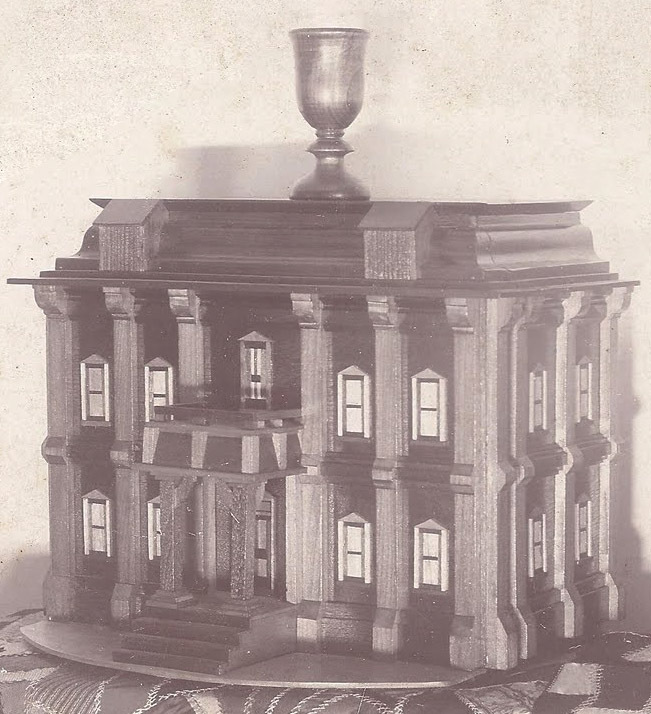 This model was fitted with a revolving lantern, and the whole contained 2,900 matchboxes. The next model reproduced is a highly elaborate affair, made by Mr. Grubb, of Grendon Terrace, Atherstone. This is supposed to represent Nelson's famous ship Victory passing a large lighthouse. As will be seen, the ship, the lighthouse, and the entire background, with its wings, are all composed of match-boxes. Working three hours a night, Mr. Grubb finished his model in five months. The ship is 3ft. 6in. long; and the lighthouse, 5ft. 2in. high, and nearly 2ft. square. To build a circular lighthouse, with the awkward material at his disposal, was a little beyond Mr. Grubb. The designer, it should be said, is very well acquainted with nautical matters, having served as steward for some years on board a little vessel of 400 tons. Thus it will be seen that each competitor prudently followed his own bent. The next match-box model shown is an even more elaborate and ambitious original design, worked out by Mr. Joseph Bray, of Coleshill Street, Atherstone. 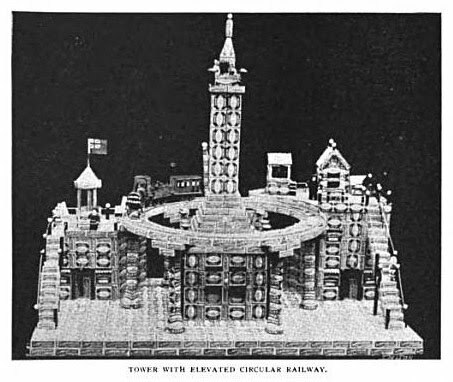 Mr. Bray writes as follows: " I am sending you a photograph of my model of a tower with elevated circular railway, made with 1,120 empty match-boxes. This was entered in Messrs. Morelands' competition held last January, and gained the fourth prize of £10. The model was 36m. long, 39m. high, and 24m. wide. The boxes were put together with glue, and the model was very firm and substantial. I worked upon it at night after I had finished my day's work. You will see that even the foundation of the platform is made of match-boxes. The bottom of the tower is supposed to contain shops; and it has four entrances and sixteen windows. The railway track around the tower was laid with rails and sleepers, and a clockwork train was run upon it at intervals. The platform for the station is on the right hand side of the model, where I also built a booking-office and signal-box with levers. On the left-hand side are a promenade, a bandstand, and a refreshment-room. Railway station, promenade, etc., were all worked round with brass wire, so as to represent railings, and the whole model had small lamps for electric lights." The next match - box model to be shown is one representing the stately old red-brick gateway of St. James's Palace, as viewed from St. James's Street. You will see from the label that it gained the fourth prize of £10. It is the work of Mr. J. H. Round, of Holly Hall, Dudley. Mr. Round writes to say that his model contains 2,380 common match-boxes and 620 wax - vesta boxes. He took particular note of the time occupied in its construction — 106 hours. From the ground to the top of the flag on the tower measured no less than 6ft. 4m. The clock was a very real one, working twenty-four hours with one winding. The dial was 8 in. in diameter. The very dial figures and hands were made of parts inevitable match-box. There was a surrounded by flowers, "Long live the Queen." It only remains to be said that both the letters and flowers were made from bits of match-box or the paper covering thereon. Yet another of these wonderful little models. 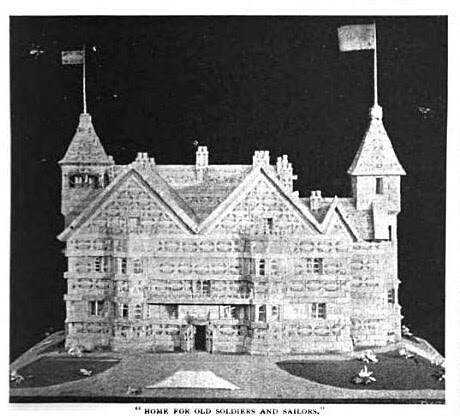 This design is an ideal one, and is supposed to represent a desirable "Home for Old Soldiers and Sailors." 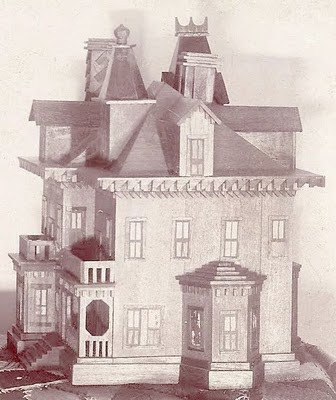 Upwards of 3,000 match-boxes were used in the construction of this model, and it was made in its designer's spare time after he had worked ten hours a day at his own occupation. This model is the work of Mr. Evan H. Jordan, of Oakamoor Mills, near Cheadle, Staffs. Mr. Jordan says, "It took me about a thousand hours; the only things I used were an old razor and a pot of glue." Another fancy design was sent in by Mr. J. Leavesley, of Nottingham, and it gained the second prize, this was supposed to represent, on a small but perfectly accurate scale, Messrs. Morelands' new premises. The model contained 6,000 empty matchboxes, the sand-papered edges of the boxes themselves forming the stone dressings of the building. Other striking instances of ingenuity were that the front of the boxes went to make the red brick facade: whilst the tiling on the roof was composed of the blue and amber of the insides of the boxes This model was nearly 6ft. square. A particularly good and accurate representation of the Great Wheel at Earl's Court is next reproduced. This model gained a first prize of £50. Mr. S. Jennings, of 32, Richmond Street, Walsall, was the designer. The wheel contains 2,110 match-boxes, every one of which had to be cut, carved, and dovetailed into shape. 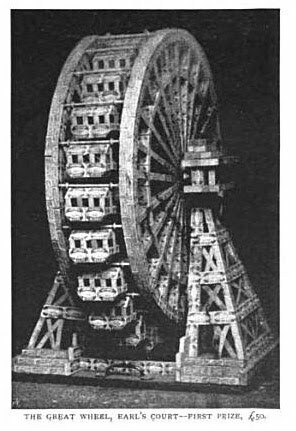 The wheel has twenty - four cars, and each car has eight windows made out of mica. By a clockwork arrangement the wheel will work for fifteen minutes after being wound up. The model is 4ft. high; and Mr. Jennings tells me that no fewer than 500 of his neighbors came to see it at his house. Bolles, Albert Sydney. Industrial History of The United States. The Henry Bill Publishing Company : 1889. Brotherhood of Locomotive Engineers. Locomotive Engineers Journal. Cleveland, Ohio : Brotherhood of Locomotive Engineers : 1886. The Strand. Marvels In Matchboxes. G. Nenues. New York. 1898. Carringer Match Box Models. Cabinet Card. ca. 1896. Digital image. Privately held by Randy Seaver, San Diego, California. 2010. Got A Light? Tintype. Unknown. Privately held by the footnoteMaven, Preston, Washington. 2010. All photographs contained in the Twice Told were a part of the original article. It's truly a shame that in our civilization making "progress" we no longer have skilled artisans like these of old. I imagine there are some around, but using different media. Excellent and informative article, as always! I knew nothing about this. I never stopped to think how important matches were to the lives of our ancestors. They didn't waste. They took a throw-away and made it an art form. Amazing! And thank you Randy, for introducing it to us. Thank you, fM, for telling the story of matchbox architecture. Fascinating. Poor Edgar Carringer never married, and was pretty much a lost soul it seems. He depended on Austin and Della Carringer for some support, although he had his own home away from their home. In 1929, Della often mentions in her Journal that she gave Edgar $5 or $10 for doing odd jobs around the property. Edgar's fame will now live forever! This introduction to an amazing art form is down to you and Edgar. When you read the amount of hours it took to complete these models you have to look at Edgar quite differently. Alone, yes, but occupied. And without question, talented. So, thank you Randy for allowing me to commandeer your family. When I was about five or six, I started making a model of the Empire State Building (as pictured in one of my Ladybird Books). At that time, matchboxes were still being made out of wood, although the trays were cardboard. I was making good progress. Then, at the age of seven, I went to boarding school, and the school holidays never seemed long enough to do everything. Besides, the matchboxes being supplied by my Dad were now entirely made from cardboard, and that didn't work as well - well the two together didn't work, anyway. Sadly, the half-finished project languished on a shelf my bedroom, gathering dust, and when we moved house a few years later, I think it must have been a casualty. I would have loved to have seen that, Brett. Until Randy's photo, I didn't know matchbox models existed. Matches and boxes had their dark side being closely tied to child labor. Your child labor was of an entirely different and more pleasant kind. Wow. What an interesting subject and photos. I discovered you via the blog Eastlake Victorian and have really enjoyed my visit. I look forward to your future posts! Has It Happened Again, PennyD?